Saturday morning we took another long bus ride; this time to the South Street Seaport, a primo tourist destination. We escaped the crowds and went to the museum. It had been written up in the NY Times on Friday, probably bringing a small increase in customers, but it was quiet and pleasant with some good exhibits. I particularly enjoyed the Manhatta/Manhattan room where a plastic model of the island demonstrated what it looked like from the time before the first Europeans arrived until the present. Very nice. Afterward I tried to do a little shopping, mainly a new pair of sneakers. I wanted to buy them in Pittsburgh but my favorite shoe store now carries only New Balance. It may be a good shoe, but I’ve never had a pair I liked. The neighborhood store here in NY also seems to have mostly NB. So I went to Macy’s. They are renovating. The signs promise it will be magical but for now it’s a zoo. I finally found the shoe department, found something I wanted to try and couldn’t get a sales person. Exhausted, I left and went uptown to Harry’s Shoes, a Manhattan icon. At one time they had three storefronts. Now they have one. They had the same shoes for $50 more, and again no salesperson. Maybe I have truly become invisible. Although I would like another pair of shoes here, I’ll wait and try again in Pittsburgh. 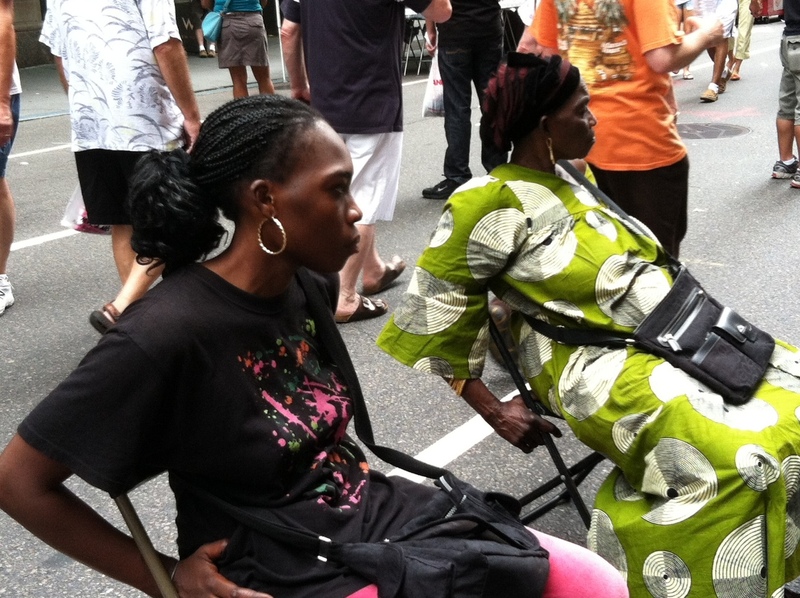 Sunday was the street fair and then a train ride to Bronxville, a northern suburb to see friends. Lovely day. The picture below shows the women who belonged to the goods laid out in the previous photo. This entry was posted in New York by ruthek. Bookmark the permalink.